May 13  The High-Point of our Trip! It is May 13th, Friday the 13th. Back in California, Ryan Garvin is turning 13 on Friday the 13th; that’s a pretty interesting day to celebrate. Here on the other side of the world we are having a fantastic time. We walked to Gorak Shep; you know that’s the last outpost before Everest Base Camp and it is the base of the famous peak Kala Patar which we climb for views of Everest. Our walk up here today was along the glacial moraine, and it was very beautiful. The weather is unsettled, we walked on light snow part of the way, and we weren’t sure what we would see when we climbed up on Kala Patar. We arrived here and had a nice lunch prepared by our staff, took naps in our private rooms, and at 1pm we started to the top of Kala Patar. We decided about half way up that the blowing snow was mostly all we would see and we settled into conditioning instead of the true summit today; knowing that tomorrow we will be leaving all the way to Everest base camp. Danny decided to stay and wait for some views of Everest which he did have on the way down; Everest emerged from the clouds a time or two. But all and all we had a good conditioning day, and the team looks to me very strong and fit to go to Everest base camp tomorrow. 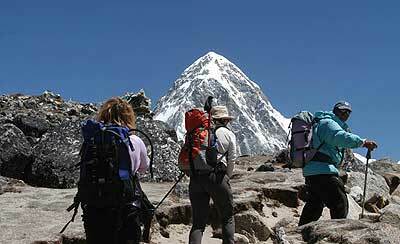 It will not be an easy walk, it is a rough walk up the moraine, it‘s an hour still from where we are now, but everybody is very excited about it, very healthy, and this is the high point of our trip. 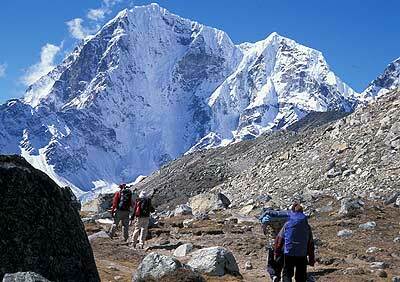 We are right up at Gorak Shep, ready to go to Everest base camp; we will call you from Everest base camp tomorrow.